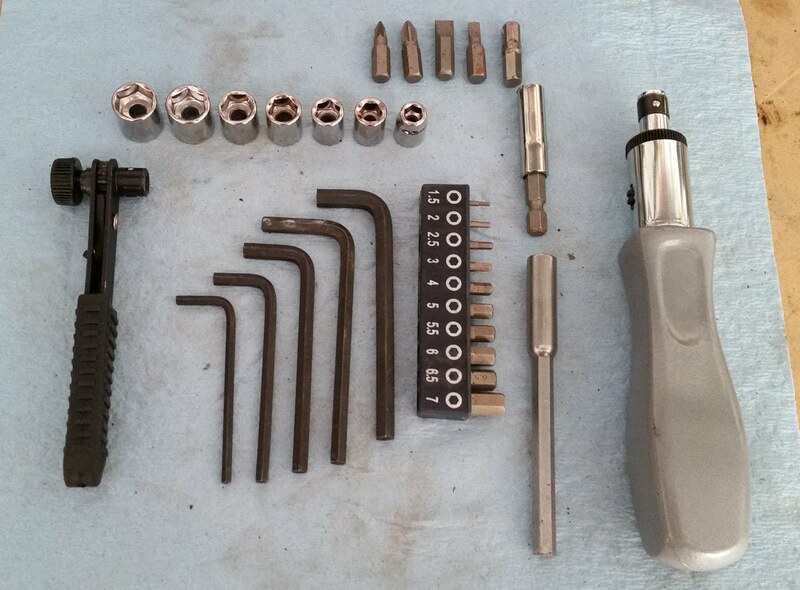 Like most motorcycles, my (used) bike came with a toolkit. However, experience showed it was not that useful. 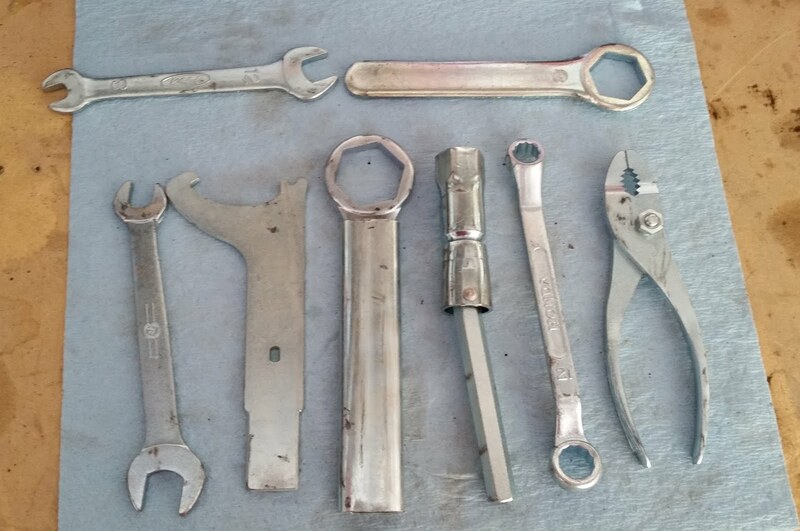 I did not find a lot of help out there with respect to tool kits specific to motorcycles, so here's what I've ended up with. 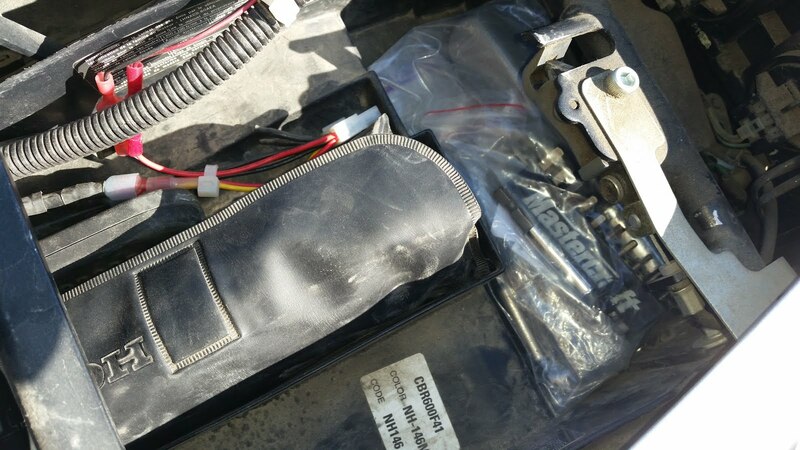 The most common problem I had with the bike was a dead battery. This has only happened a few times in ten years, but does require the seat to be removed for a jump. Oddly, the factory toolkit does not include the right tools for this. Here is the stock tool kit. Obviously some of these might prove useful if you were doing certain types of work. I would say that if you're in such a situation, you're probably screwed, since you ain't going to be going anywhere soon, but you never know. I have a tough time seeing how many of these are even vaguely useful for my motorcycle. 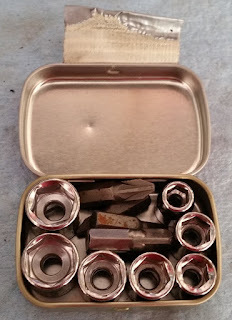 The big wrenches, OK - though if you're needing to remove a major bolt, you are (again) probably screwed - but I do not see how the pliers or box-end wrenches are useful since you can't access most of the fasteners with them. You certainly cannot get to the seat fasteners with the provided wrenches. 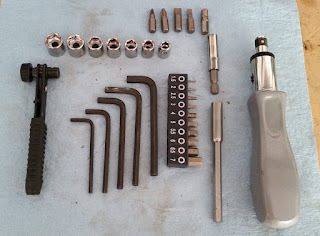 The tools I use most on the bike are a ratchet handle and sockets, and the kit does not come with either. 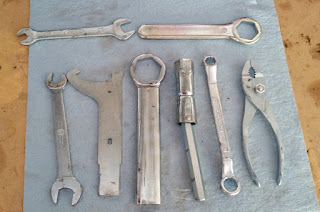 It also does not come with any hex keys or bits, which are necessary to remove panels from the bike (not that I want to do major repairs in the field, but being able to remove and discard wrecked panels is a benefit.). So I wanted to add them. The ratchet handle proved the most problematic. Most are $30 and up and are not small enough to stow in the bike. Eventually I re-discovered a small mini handle I'd seen before, on eBay for about $2. This was the right size, price point and durability for what I needed - the seat bolts are not high-torque bolts, obviously. Most of these I had just lying around; the rest were on eBay for next to nothing. I think the long extension was the most costly, but I needed the extensions to get the seat off the bike. I could also have done away with the screwdriver handle, but I had an extra one and it was not too large for my purposes. Also, if the ratchet or screwdriver break, the other tool acts as a backup. 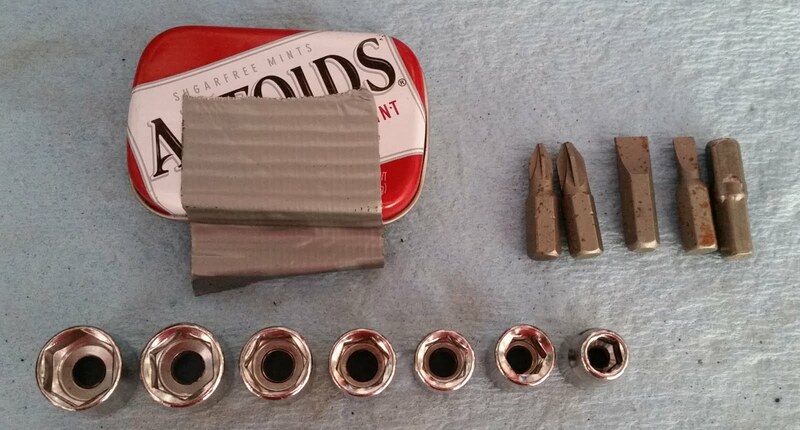 I could also make do with 2 of the sockets and 2-3 of the hex bits. But they are all small so why not include all. I mostly threw them in on the very off chance that I might end up fixing somebody elses' bike. Both kits fit so I keep them both, rather than replacing the old kit with the new kit. 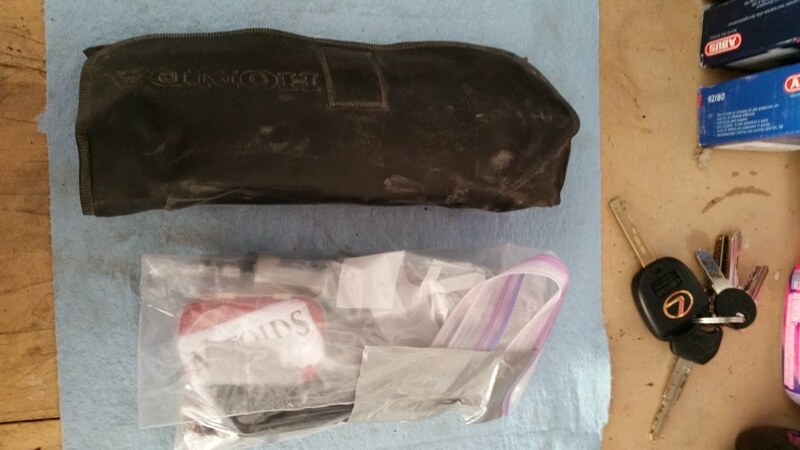 I also keep other items like zip ties, a small roll of duct tape, a couple of light sticks and a flashlight elsewhere in that same compartment. I tested the toolkit and was able to get the seat off the bike with little trouble, as well as work on most of the obvious fasteners and adjustments. So I guess it will work well enough in a pinch, which is the point. You will note I did not include a multi-tool. IMHO having the discrete tools I need obviates the need for a multi-tool, so keeping one will not add value, but you could easily toss one in in an attempt to cover all bases. I carry a few little tools with me all the time anyway, and for long trips I keep a Leatherman in my riding suit pocket. Not because I needed one, but because I have one, so why not. But I don't think I would go out of my way to buy a multi-tool for the bike since most will not include adequate sockets, bits or such for working on that vehicle. Update 2016-12: Canadian Tire was selling stubby ratchet handles and stubby interchangeable-bit screwdrivers for $3 over Christmas. As these are cheap, small, and reasonably durable, either or both of these would be a good addition or substitution tool for what I have above. The drivers are about half-size - not full-size, nor a true stubby - and should be just about right.